The late actress had a hotel in Las Vegas in 1990s. There is heartbreak around the world after the death of Hollywood icon Debbie Reynolds . Reynolds died a day after her daughter actress Carrie Fisher, 60. The 84-year-old Reynolds left an indelible mark on the valley. She had a home, ran a hotel and performed in Las Vegas for years. "From what I understand, her last words were she wanted to be with Carrie," said entertainer Dennis Bono, "and the good Lord recognized that." Bono is the singer and host of "The Dennis Bono Show," a nationally syndicated musical variety/talk show in Las Vegas. "I first met her in the late 80s," he said, "and then she opened up the Debbie Reynolds Hotel." The Neon Museum has the sign from the hotel. Bono's wife, Lorraine Hunt-Bono, has known Reynolds since the 1960s. "Vegas was just a special place for her, she was always around with the Rat Pack," said Hunt-Bono, an entertainer and former Nevada lieutenant governor. 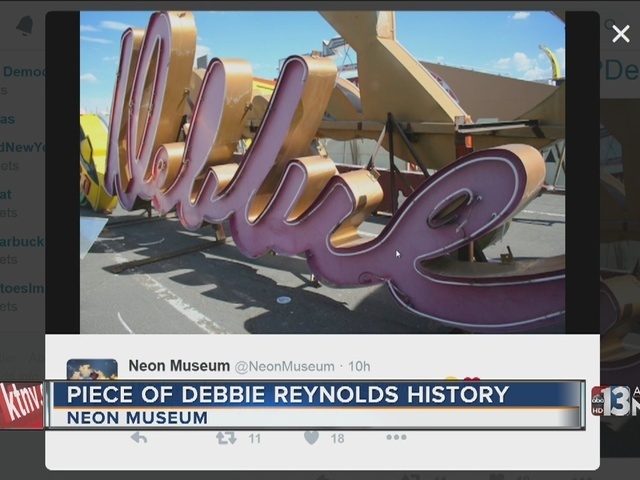 "Growing up and living in Las Vegas, everybody knew Debbie Reynolds," she said. Right now, the couple -- like the world -- is mourning the loss of the 84-year-old. According to TMZ, Reynolds was discussing funeral plans for her daughter when she reportedly suffered a stroke. "She was just unsinkable, like she was in that movie," Bono said. "That's why this is such a shock." Fans and friends say they'll remember her body of work and beautiful soul. "She was magnetic and warm and charming and loving and mischievous," Bono said. "Stories that she would tell when she would come on my show, and I'd go oh God, you're not going to tell that story are you? And she did. And my audience adored it."